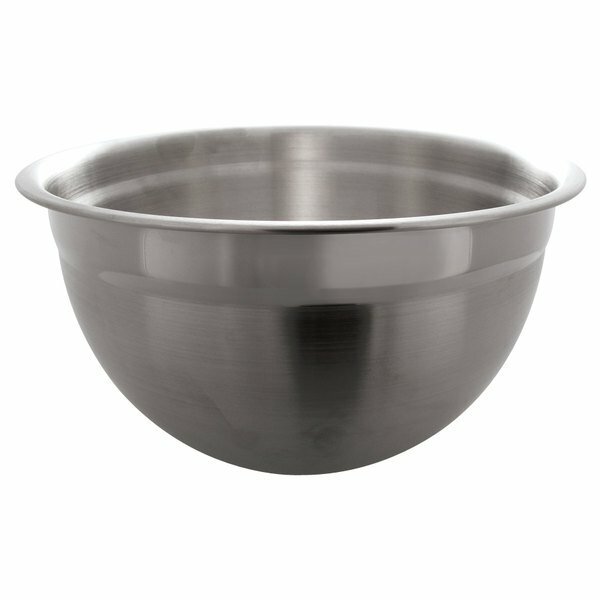 This Tablecraft H833 5 qt extra heavyweight mixing bowl is made of heavyweight 18/8 stainless steel. Food preparation is much easier when you have the right tools. Whip cream, knead dough, toss salad, and mix batter in this durable 5 qt stainless steel mixing bowl that stacks for convenience. It gives you beauty and style in just the bowl you need for almost any kitchen job. This 5 qt extra heavyweight mixing bowl is the perfect tool to begin the preparation of many great meals your family or customers has come to expect. This is it...the one super heavy duty mixing bowl you've been looking for. It is high-quality non-reactive 18/8 stainless steel. You could play soccer with this thing, or use it as a makeshift helmet in war. There's just no feasible way you could wear this thing out in kitchen environment. If I try to squeeze the rims together in my arms, it does not budge a hair. Will last a life time, and at this price it is a no-brainer. Bought 3 for a mixing assembly line, and they all stack beautifully together and separate easily. I wanted a true heavy duty mixing bowl and purchased the 8qt and 5qt bowls. Great quality bowl with a solid weight unlike the flimsy bowls you normally find. This size is perfect for most jobs and since it\\\\\\\\\\\\\'s stainless steel, it\\\\\\\\\\\\\'s easy to get it clean without retaining odors or oils from previous use. I recommend getting both 8 and 5qt sizes. These bowls are great and I am glad that I ordered two of them! They are the right size for doubling muffin and quick bread recipes!